H D Deve Gowda: I am so happy that you have called me today to speak. Please do not restrict me to speak only for three minutes. I hope that I have got the liberty to share my experience. H D Deve Gowda: I came to this House in 1991. The Narasimha Rao Government did not have full majority, but even then the contribution made by Shri Narasimha Rao as the Prime Minister and Dr. Manmohan Singh as the Finance Minister with regard to the economic reforms, liberalisation, industrialisation, etc. is immense, and these things have changed. The situation at that time was such that this country was about to go into a debt trap. I used to participate in every Session from that day. Our Prime Minister is sitting here. Let me be frank that the financial restraints were so much that we had to approach the World Bank and IMF. I am not going to deal with this matter at length, but I would like to mention only one thing. I have seen all the coalition Governments, namely, Dr Manmohan Singh’s coalition Government, late Shri Vajpayee’s coalition Government, etc. in these 29 years sitting in this House barring about 22 months as I was defeated in 1999 and I came back in 2002. I must congratulate your good-self. 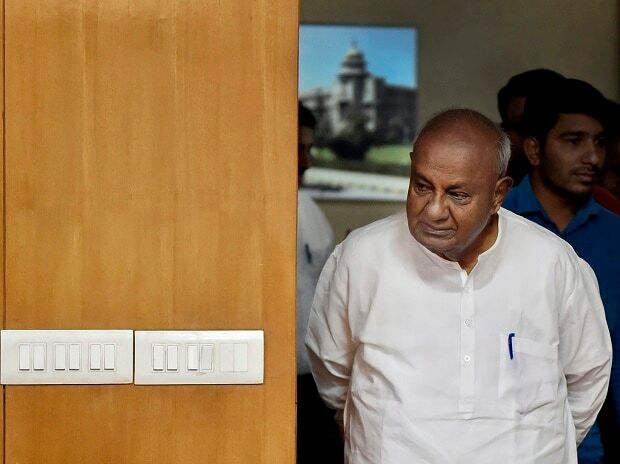 H D Deve Gowda: You have given an opportunity to all political parties to express their views before we depart from here. I have seen Shri Vajpayee as the Opposition Leader; Shri Somnath babu was the Opposition Leader; Madam Sonia Gandhi was the Opposition Leader; and today, Shri Kharge ji’s Party, though has not got the majority, but even then you have recognised him as an Opposition Leader for the purpose of giving certain decisions on issues like Lokpal and such other issues. This House never missed the opportunity of debating on the issues of farmers. I would just like to recall my events. This is the 16th Lok Sabha. I came to this House and I moved a 193 Discussion, and your good-self suggested that the Business Advisory Committee (BAC) has to clear it. It was not possible because I approached the BAC Members also, but the matter was not taken up. Why am I telling this? It is because if the smaller Parties, like us, having one Member or two Members or three Members want to discuss something under the Rules, then there are certain procedures. You will not be able to carry forward. That is how I have been not given sufficient opportunity to discuss in this House. You know how from the beginning I fought for the farmers. I am not going to deal with that matter now. The question of corruption issue is not new for us. In the last 60 years, I have been watching. People have come to the conclusion that all politicians are corrupt. This atmosphere is there; irrespective of the political parties, we are all responsible. People have lost trust in leaders. Only for gaining our reputation we are all destroying ourselves. I beg of you, this type of debate about the political office is going to damage the entire system. Prime minister is sitting here. In the elections there were some exchanges of words. If you get more than 276 seats, I am going to resign. This is what I told. When he got 282 seats, I went to see him, to offer my resignation. He told me, don’t take it seriously. You are one of the experienced politicians, you must not resign. That is what I told him. I met him three-four times. I have no grouse against anybody. Madam Sonia Gandhi, as Leader of the Opposition, I also watched her performance. Some people would debate on her citizenship. In these 30 years, let us be honest, that is not an issue. But some people have raised the issue. On one occasion, she was unable to become the Prime Minister…. Sonia Gandhi: I didn’t want to. H D Deve Gowda: No. Just a second. What has happened, I would tell you. This is not your desire. Some atrocities have happened. Sonia Gandhi: That is another time. H D Deve Gowda: Vajpayee ji was a great man. He went for a Prayaschit Satyagraha near Rashtrapati Bhavan. In Bhopal, I told that Vajpayee ji is a great man. Why did he go there to offer one day Upwas Satyagraha. It is not going to help; you must take decision based on the constitutional powers. At that time, press people asked me as to why am I asking resignation of Vajpayee ji? I told them, why not? They asked: Who is the next Prime Minister? Why not Madam Sonia Gandhi, the Leader of the Opposition? What is the citizenship issue? I myself raised that issue in Bhopal. That is what I am telling. H D Deve Gowda: Let me be very frank. All of us are departing today. There is no personal animosity against anybody. Here, I met some of the Ministers personally. Irrespective of my position as the former Prime Minister, or whatever maybe, I met personally Sushma Swaraj ji, Rajnath Singh ji is here. Surface Transport Minister is not here. I went to the offices of Commerce Minister, the Railway Minister personally to take up certain problems concerning my constituency and my State. All of them obliged. I am highly grateful to all of the Ministers who are sitting here. I have no ill will about anybody. Today is my last speech. You have given me an opportunity. I met the Prime Minister four times. Always he used to ask about my health. With happiness I tell you that my health is all right. Age is also one of the factors. Advani ji is sitting here. We were in jail in Bangalore. Always we exchange words with each other. I am grateful to you to give me this opportunity to speak before departing.